Egypt, Why Morsi was ousted? Are we turning into a Military Rule? The Egyptian President Morsi was ousted yesterday (July 3) by the Army. 1 year after being elected as the first president after Jan 25 Revolution. Is the Army taking over power in Egypt? Is Egypt turning into a Military Rule? “a- The temporary suspension of the constitution. b- The Chief Justice of the Supreme Constitutional Court to take the constitutional oath before the SCC General Assembly. c- To hold early presidential elections with the SCC Chief Justice being in charge of the caretaking of the State during the transitional period until a new president is elected. d- SCC Chief Justice to be entitled to issue constitutional declarations during the transitional period. e- To form a strong and capable national government of technocrats enjoying all authorities to manage the current period. f- To form a commission that includes the full spectrum and experiences to revise the proposed amendments to the constitution, which is temporarily suspended. g- To urge the Supreme Constitutional Court to expedite the approval of the draft electoral law of the House of Representatives and commence the preparatory procedures of the parliamentary elections. h- To draw up a media code of ethics that provides for the freedom of the media and ensures professional rules, credibility, impartiality and elevation of the higher interests of the State. i- To adopt executive measures empowering and merging youths in the State establishments to become partners in the decision-making, as assistants to ministers and governors and various executive posts. In Simple words, a call for early presidential election has been set. Till the new President is elected The Chief Justice of the Supreme Constitutional Court to take the constitutional oath as Egypt interim Leader. To form a strong transitional National government to hold the executive power till the next elections. Why the Army took such move? The Army took that step mainly as a respond for the millions of Egyptians who protested in the streets since June 30 asking Morsi to call for early presidential election (Refer to: Why Egyptians are revolting after 1 year of Elections?). President Morsi did not show any kind of response to the millions of protesters in the streets. He did not even offer to appoint a new cabinet which has been a demand from the people for months already due to its poor performance and shallow vision. Morsi was very impressive in ignoring the millions in the street and only considering what the Muslims Brotherhood is telling him to do. Due to that, on July 1st General Command of Armed Forces Abdul Fattah al-Sisi announced a 48 hours period for all parties to resolve the crisis or he will announce a road map after consulting the people’s leaders and the Egyptian Youth. That simply meant, if Morsi did not respond to the people’s demands, the Army will take a move to force that. The following day, in his speech, Morsi looked very nervous and he still ignored the people demand of early elections and he mentioned that he may consider appointing a new cabinet. That was totally below the aspirations of the millions of the protesters in the streets. There clear demand was to call for early elections. 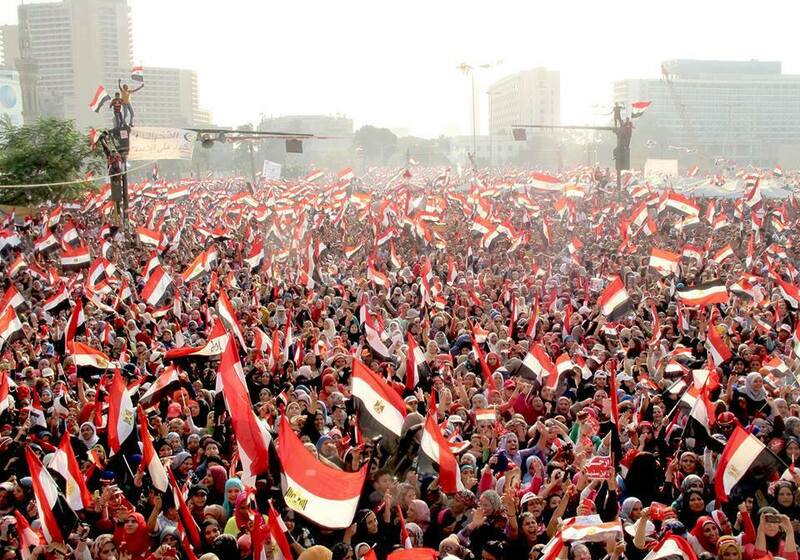 On July 3rd, millions of Egyptians continued to protest in the streets asking Morsi to call for early elections. Why the Army had to interfere? Why he did not let the People to do decide by themselves? Millions of Egyptians were protesting peacefully, however Morsi did not show any kind of response. Morsi himself in his speech on July 2nd said he will defend his position with blood. The Muslims Brotherhood and the extreme Islamists who are also supporting Morsi have been repetitively announcing that they will defend Morsi with blood and they are ready to fight. When you have a situation where Millions of Egyptians are asking peacefully the president to call for early elections and you have a president with his supporters saying they will defend his position with blood. There is no other way to save shedding bloods than the Army to take a move in a respond to the People’s demands. What are the chances that the Army will take over power turning Egypt into a military rule? There are concerns out there of course, however I have a different belief. I believe in the Egyptian People. In Jan 2010, millions of Egyptians marched into the streets and in 18 days they forced Mubarak to step down after 3o years of corrupting the life in Egypt. When the power was handed temporarily to the Supreme Council of Armed Forces (SCAF), and they showed a slow response to the people demands in handing over the power to an Elected president. Millions of Egyptians protested in the streets and forced the SCAF to speed up with the Elections. After Morsi was elected, the Muslims Brotherhood thought that they can ignore the people again and their demands. Morsi lied about all the promised he made to the people. They did not understand that the real authority comes from the people. Now in 4 days the millions in the streets peacefully forced everyone to listen to their voices and the Army to take an action in support for that. When the revolution started in Jan 25, 2010, Egyptians decided to build the country on the right basis of Freedom, Justice and Dignity. It is either we accept half solutions now or we believe in the power of people and continue the struggle to build a great nation. We started the struggle and we are not going to stop until we have leaders who respect us and who are working with the people towards an ambitious vision for the future. What is happening in Egypt is an inspiration for the people all over the world. We must believe in ourselves. We are not to accept half solutions. We are not to accept Leaders who lie to us. We are to believe in ourselves. Why Egyptians are revolting again after 1 year of Elections? If you are not an Egyptian, you may wonder why Egyptians are revolting after one year of electing their current president? Should not they give him a chance to prove his abilities and give chance for the economy to boost? How would the economy progress when the country is revolting all the time? Does not democracy mean that you should let the president continue his 4 years term and if he fails, do not elect him again? Millions of Egyptians went into the streets yesterday (June 30) protesting against President Morsy after 1 year of being elected as the first President after Mubarak’s regime fall down. The protesters are asking Morsy to step down and call for early elections. Last year when the presidential elections were held, few candidates run for it where mainly Five of them stood a chance to win that elections. Four of them are from the opposition at Mubarak’s time and the last one was the last Prime Minister before Mubarak’s regime fall. The first round of elections showed quiet similar results between the Five candidates with the Muslims Brotherhood’s candidate (Morsy) and Mubarak’s prime minister (Shafiq) ranked first and second respectively. As many Egyptians oppose Mubarak’s prime minister to be the president after a revolution against that regime, many as well do not feel comfortable voting for the Muslims Brotherhood (MB) Candidate. MB has not shown any willingness to be transparent about their financial operations and many Egyptians did not feel comfortable towards their so called “Islamist” Agenda for Egypt. Many Egyptian (including me) decided to boycott the 2nd round as a sign of rejecting both of the candidates. My last article before this which is written in Arabic was just before the first round of elections last year where I wrote that under any circumstances I will not vote for the MB candidate. Simply because I do not trust them. Morsy knew that he is going to lose the 2nd round of elections if he could not convince those who voted for the other candidates in the first round to vote for him instead of boycotting or directing their vote to the other candidate (Shafiq). Morsy started going to all media channels and meeting all political parties and leaders trying to get their support. In a meeting in Fairmont Hotel in Cairo, Morsy signed on a written promises that he said he will deliver if those leaders were to support him and call their supporters to vote for him in the 2nd round. Those promises were mainly about the way he will rule Egypt if he become the president, building a democratic regime, keeping the unity of the Egyptians, working will all political parties from all background and not following a strict MB’s agenda and finally committing to the goals of the Jan 25th Revolution. The 2nd round came and most of the political leaders called their supporters to vote for Morsy based on the promises he agreed to deliver. In the 2nd round Morsy got 12 millions votes (comparing to 5 millions in the first round) which put him slightly ahead of the other candidate. Morsy won the presidency and many Egyptian were relieved that Mubarak’s prime minister did not win. It was time for Morsy to start working with all the Egyptians, building a great nation together. However Morsy did choose a different way. He worked mainly with his group the Muslim Brotherhood only. He appointed a cabinet which included either independent people or others from the Muslim Brotherhood. He made a modification 3 times on the cabinet, increasing the number of the MB’s ministers every time. The same happened with appointing the mayors. He passed a new constitution for Egypt which followed a conservative Islamist agenda and does’t guarantee proper rights for the Egyptians and give chances for a new dictatorship. Most of the other parties opposed and resigned from the committee that was writing it. However Morsy still proceeded with it. That’s beside other cases such as; whenever there will be small demonstrations against him, the Muslims Brotherhood would send their supporters to fight with them in the streets. On occasions, protesters were killed from both sides as a result of that. The worst was that Morsy ignored what the MB is doing and acted like there is no Law in the country. Due to his bad leadership, Morsy could not control the country and it fell under many economic crises in the supplies of electricity, water and Petrol in many occasions. The prices of the food kept on increasing and Morsy just kept on asking for new loans from the western countries. Morsy looked lost and without a solution and in the same time failed to listen to the opposition and the people on appointing a new cabinet that have better solutions for the economic crisis. Morsy also let the conservative Islamists to spread a speech of hatred against Egyptians opposing him utilizing the religion to build such speech and he did not stop that. In occasions he was present by himself and he did not act as a president of all Egyptians who should not let some conservative Islamists spread such hatred speech against millions of Egyptians. Without going into more details, Morsy has failed miserably to listen to the Egyptians and ignored them on all ways possible. The only way to give every dictator a lesson is to force him to step down if he was too stupid to consider his people. In Egypt, we revolted against Mubarak in order to build a country based on Freedom, Justice, Dignity and Equal opportunities for everyone. Egyptians will not accept a mediocre president anymore. The world is moving too fast around us. New technologies are being developed everyday, and if we leave a dull president for 4 years to try his miserable agenda, that will be too much time for Egypt to lose. The Economy will not stand, the people will not stand and each day you lose on the wrong direction, you are left behind years as a Nation. A president in Egypt will succeed if he really believes in the power of his people and could communicate his ideas to them. Note: Most of Morsy’s supporters will not agree with what is written here. But, that is the reason millions are in the streets. Starting in less than an hour the First ever Presidential Candidates in The history of Egypt (at least the modern one) is happening. What people thought of as a far to reach dream is happening. I dun want to overwhelme the Debate or the Presidential Election in General becasue it is not the end of the Road in Egypt. It’s just a milestone at the beginning. But for sure it’s something worthy for the martyrs sacrifices in The Egyptian Revolution. Glory to the Martyrs of the Egyptian Revolution. 1. مبارك لازم يستمر لسبتمبر علشان استقرار البلد والإقتصاد ميروحش في داهية!! 2. مبارك استجاب لمطالب الشعب وهينظر في طعون الانتخابات وهيعدل مواد الترشيح للرئاسة ! يعني خلاص خد نفسك وروح وكفاية وقف حال بقى!! 4. مبارك عين عمر سليمان نائب الرئيس وده راجل ماعليهوش كلمة !! 5. طب يا جماعة نستنتى لسبتمبر بدل مانخرب البلد!! 2. طب مين اللي هيمسك الفترة الانتقالية؟؟ أنا مش عاجبني البرادعي!! هاتلي واحد يتفق عليه الناس؟! يعني إيه؟ يعني دي مش فترة وضع سياسات للبلد دي مجرد فترة تجهيز علشان كل واحد فينا يختار اللي هو عاوزه فـمش مهم إني أكون موافق على سياسات اللي هيمسك المرحلة الانتقالية قد ماهو مهم إنه يكون راجل ذمته نضيفة وعنده خبرة كافية لانه هو مش هيحط أي سياسات للبلد بل مجرد إدارة عملية وضع الدستور الجديد ..
ده اللي أنا شفت الناس بتكلم فيه .. شباب مصر محتاج دعمنا وإذا كنت بتقرا دي وإنت في مصر فـاقفل الكمبيوتر وانزل ادعم شباب الثورة .. وإذا كان تمن الثورة إننا ناكل عيش حاف حتى يسقط نظام مبارك فـدي اقل حاجة نقدمها لمصر ! !